After retiring a very reliable companion I had worked side by side with for more than 4 years, the Dell Mini Inspiron 10, I decided to find a secondary laptop I can use for play so as not to use the same device for work and play. :) For work, I use my husband's old but dependable HP Compaq Presario. I never thought it would be difficult and tiring to find a laptop. We had inquired through numerous computer shops at the Festival Mall in Alabang (because most gadgets are significantly cheaper here compared with other malls) until we chanced upon a computer shop at the far end that we initially didn't see. It's a sister shop of the Octagon network. It's a lucky chance because the Lenovo G40 is available there, whereas, it's out of stock in the official brand store. The unit here is more affordable by more than 5k too compared with other shops if I remember it correctly. Although the processor is only an Intel Celeron N2830, it's clock speed is at 2.16 GHz, making it fast. It's design and built is slim and stylish. I like the wood floor-like color finish. 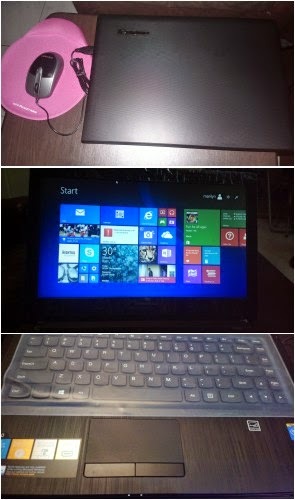 Operating system is the latest Windows 8. I find it challenging maneuvering from the apps section to the desktop and vice versa though as I'm used to the Windows 7 OS interface. High Definition and wide display at 14" with 1366x768 LED screen. Graphics is also HD. Memory is at 2GB DDR3. I don't need that much anyway because even if it's supposedly a computer for play, my idea of play are websites not related to work like social media. I won't be downloading apps, software, or applications that are not necessary. 4 cell battery is long lasting, more or less 8 hours of minimal use. I don't exactly use it 8-hours straight but browse through it from time to time. Affordable for those in a budget, just over Php16k. I got it through a 12-months installment. So if you're looking for a basic, budget friendly but performance driven laptop for web surfing, office work, and minimal gaming, the Lenovo G40 is perfect for you.